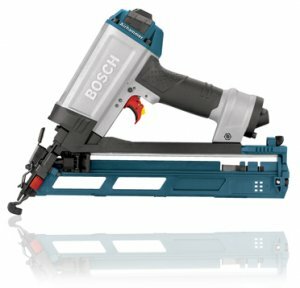 This is great news... Bosch has finally come out with a full line of pneumatic fastening tools aka nail guns, and compressors. Anyone that uses nail guns all day (like I do) knows how much a great gun can make a difference, so I hope these gun are great. One more brand to help improve nail gun technology is great news. The new Bosch pneumatic line uses a new Full Force Technology to drive the fasteners. From my understanding other nail guns use the built up pressure of the driving head to push the driver back into place after each shot. What this does is add resistance to the driving force. Full Force Technology uses one burst of air to drive the driver, and a second burst of air to reset it. This allows the full force of the driving action to be used each time. So what has Bosch included in this new line? How about 7 new nailers: Full Head Framing Nailer, Clipped Head Framing Nailer, Coil Roofing Nailer, 15 Gauge Angled Finish Nailer, 16 Gauge Straight Finish Nailer, 18 Gauge Brad Nailer, 18 Gauge Narrow Crown Stapler, As well as 5 new air compressors from 3 gallon up to 8 gallons. I will be checking these out when they hit the stores. No info on release date or prices yet.